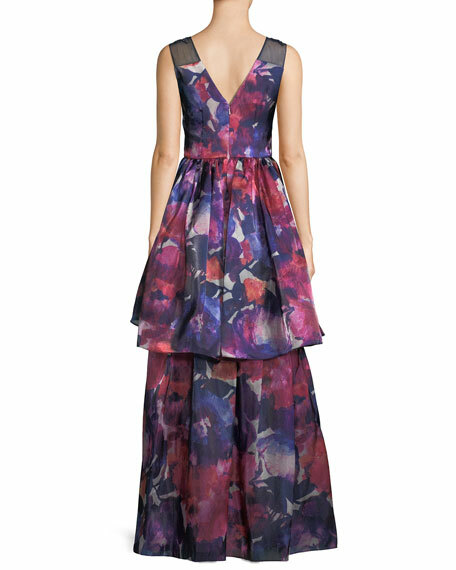 David Meister evening gown with floral-print. 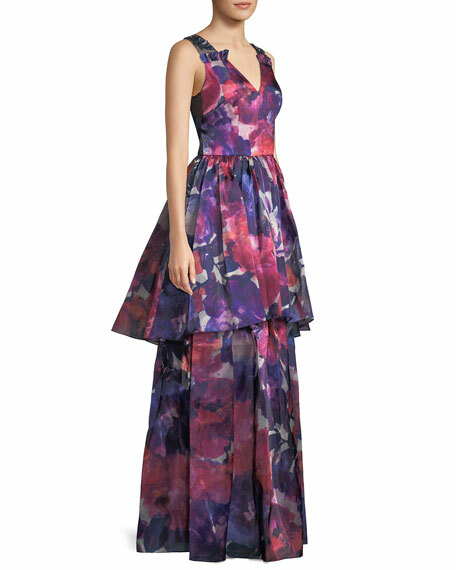 Carolina Herrera evening gown in wide-striped taffeta. Button details down center front. Plunging, sweetheart neckline. Cap sleeves. Fitted bodice. Full ball skirt. Hidden back zip. Puddle hem. Polyester/silk. Lining, silk. Made in USA of Italian materials. Jenny Packham "Aries" sequin embroidered evening gown. V neckline; wrap front w/ satin ties. Strong shoulders. Long sleeves. Wrap silhouette. Jenny Packham "Aries" sequin embroidered evening gown. V neckline; wrap front w/ satin ties. Strong shoulders. Long sleeves. Wrap silhouette. Floor-length. Silk; lining, polyester. Imported. Model's measurements: Height 5'11"/180cm, bust 32"/81cm, waist 25"/64cm, hips 36"/91cm, dress size US 2/4. EXCLUSIVELY AT NEIMAN MARCUS Jovani velvet evening gown. Approx. 48"L from waist to hem. Deep V neckline. Sleeveless; thin straps. EXCLUSIVELY AT NEIMAN MARCUS Jovani velvet evening gown. Approx. 48"L from waist to hem. Deep V neckline. Sleeveless; thin straps. Trumpet silhouette. Open back; hidden zip. Floor-length. Polyester/spandex. Polyester lining. Dry clean. Imported. 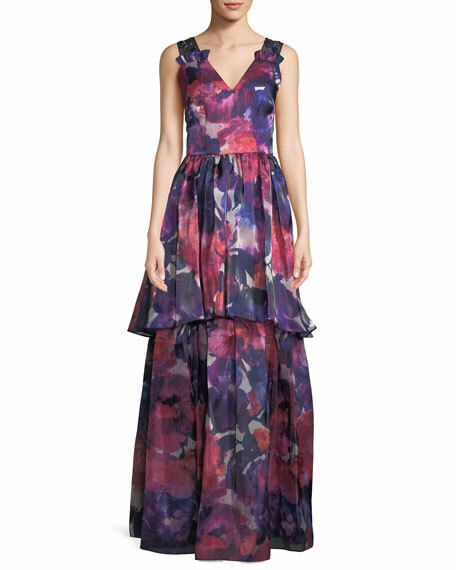 Model's measurements: Height 5'11"/180cm, bust 32"/81cm, waist 25"/64cm, hips 36"/91cm, dress size US 2/4.